Optional materials, coffee and cookies. The one material that I did spend money on was the soil. For about $10 I grabbed a bag of Jiffy Natural and Organic Seed Starting Mix. Using a seed starting mix has proven, in my experience, to be a good value. The small roots do better growing unrestricted in the loose mixture. Once you have had a reasonable amount of coffee you are ready to begin. Since my tiny greenhouse holds only two K-cups I set out two cookies. This ought to get me thru the process. If you are interested in starting a larger number of seeds then start looking for a large clear plastic container. Anything with a flat bottom and removable lid will work great. Perhaps those $5 cookies that are always on sale at your grocery store would make a good greenhouse? Once you have enough K-cups then you are ready to begin. In the next step I will show you how I prepared the K-cup so that it is ready for the seeds. The K-cup is made up of a plastic cup, filter containing coffee grounds and tin foil lid. The only part that is required for this project is the plastic cup. Use a plastic or metal butter knife to cut off the tin foil lid. Remove as much of the lid as is easy for you. Then use the butter knife to tear thru the paper filter. Yes you fingers to pull the filter out of the K-cup. Add your soil of choice to the tiny cup and place the milkweed seeds on top. I don't cover the seeds because milkweed loves the sunshine. Soil covering the seed will block light and may delay the germination of the seed. There will be enough moisture for the seed because of the high humidity that will occur inside the tiny greenhouse. Before I finish I like to spray the top of the soil filled cup with a few squirts of water. Although the hole in the bottom of the cup should wick up water I think getting all the soil wet right away may speed up the process and ensure the seed is moist right from the start. Soak your seeds for 1 or 2 days before starting this project. Soaking seeds 24-48 hours will increase seed germination significantly. Check that there is water in the bottom of the tray so that the humidity in the greenhouse stays high. Spray seeds directly with water if the surface soil becomes dry. Monitor the temperature of the seed and soil, if it is hot then move a few feet away from the window. Move plants outside a few weeks after last frost. 2015 is an exciting year for milkweed. There are many private organizations and public nurseries that are working very hard to bring milkweed plants to local stores. 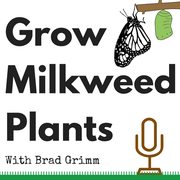 Until their network is able to support the massive demand for milkweed you can use readily available milkweed seeds to begin growing asclepias plants in your home today. There is great news in this update about my tiny greenhouse. But with the good news is also bad news. After having the tiny greenhouse on the window sill for a few days I dropped it on the ground. Not a total loss by any means but I felt like a klutz. The K-cups tipped over and the dirt and seeds came out. Thankfully the spill was contained to the little sandwich container. It was hard to locate the seeds so I simply spread the dirt evenly and added some water and gingerly put it back on the window sill. Today is twelve days after the experiment began and all four seeds, two per cup, have sprouted! Only three are visible in the photo but there is a fourth seed in there somewhere. The root actually extends all the way to the bottom left. After a successful transplant in mid March these milkweed plants have continued to grow very well as an indoor houseplant. They get indirect sunlight in the morning and I adjust the blinds in the afternoon to give them more or less sunlight depending on how quickly I want them to grow. More sunlight encourages growth. Overwintering milkweed seeds results in higher germination of the seeds and yields more plants in the Spring. My favorite method is to make a one gallon greenhouse. The one gallon greenhouse protects the seed from scavenging animals and retains the moisture thru the winter. In the Spring the one gallon greenhouse raises the temperature of the seed earlier while also protecting the seed from freezing temperatures later. It's a real win win. The water needed is also reduced because much of the water is retained within the one gallon greenhouse. Once the milkweed plants are bursting out of the top then it is time to transplant. Transplanting is simple. The plant and roots slide out the top of the jug and you place them in a hole of equal size. Add water and sunshine and wait for the monarch butterflies to lay their eggs on your new plants. If you found this page useful, please share it with your friends!